One of America’s top cross country and cyclocross pros is hanging up his race bikes. 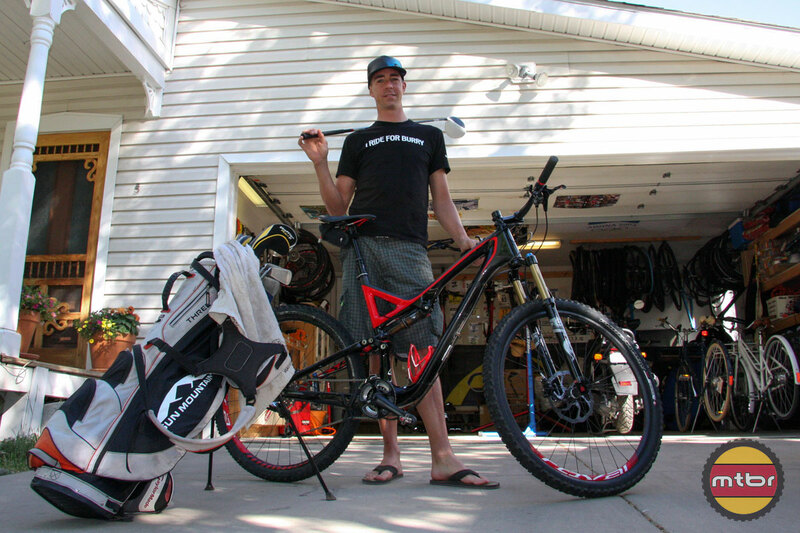 Durango, Colorado-resident Todd Wells, 41, announced this week that he’s retiring from racing. Among his long list of achievements are three Leadville Trail 100 wins, three U.S. CX national titles, and 12 U.S. MTB national championships. Wells also represented the U.S. at three straight Olympics — Athens 2004, Beijing 2008, and London 2012. More than just a racer, though, Wells was and remains one of the sport’s true nice guys, always willing to spend time with fans — or in my case, answer journalist’s questions. Check out this exclusive Mtbr at-home interview with Todd Wells in 2013. Wells made the announcement on his personal website, where he looked back on a career that spanned three decades, starting as a kid with his love of all things BMX. Here’s the complete transcript of that post. It’s a long read, but also very revealing about both the man and the sport. Congrats on a great career, Mr. Wells. And good luck getting that PGA Tour card. Wells was always a man of many interests, including golf and riding bikes that were more fun than fast. If you want the short version, it’s been a great ride and I’m calling it a career at the end of this year. For more insight see below. I always wanted to be a professional bike racer when I was growing up. The dream was always based around 20-inch wheels, not 26 or 29 or 700c. It’s funny how things end up working out. As a kid I would pour over BMX magazines, read and reread about the races. I’d rip out the pages and plaster the walls of my room with them. There was no internet and the only coverage I’d get was each month at the bike shop where I would anxiously await the latest issue of BMX Plus. I spent my youth riding my bike every day after school back in NY. In the winter I’d ride early while the dirt was frozen before it turned to mud and any chance I got to go street riding in town I’d jump all over it. I had trails in my backyard and even though all I did was ride my bike I was never very good. I think the best I ever got was 14th overall in the expert at the NBL Grands. By the time I got to high school I realized I was never going to make it in BMX. I quit riding and started lifting weights in hopes of becoming a body builder, I was even worse at that. Then my senior year rolled around in 93/94 and I heard about this mountain bike thing. I think 5 people in my school of 2000 rode MTBs. I quickly befriended them, we rode together and I was hooked. Within the first few months of riding I was better at mountain biking then I was having raced BMX since the time I was five. That’s it, I had found my career path. Wells capturing the 2011 Leadville 100 crown. My best friend at the time Barthel suggested we move out to Durango and go to school at Fort Lewis College. Having grown up in NY, never having been west of Ohio and longing for warm weather to ride all year long I was thinking more like Florida. Lucky for me Mountain Bike Magazine had done an article on Durango and how all the pros that lived there: Tomac, Ned, Furtado, Missy. Barthel also convinced me it bordered New Mexico and Arizona so it wasn’t that cold and we could do something called Nordic skiing in the winter which was like skiing but way less fun. We loaded up his Camry sight unseen and pointed it west. I remember driving through Kansas with no AC in a car loaded down so much we rode a wheelie the whole way there with a bag of ice on my lap to keep cool. When we finally arrived, it was even better then I imagined it. The first week we got to go on a group ride with Ned, Tomac and all the people I had only seen in magazines. There were trails everywhere and at least 10 bike shops in the town a size of about 8,000. Amazing. I had never seen so many bike racks on cars in my entire life. I got hooked up with the Fort Lewis team and managed to win the Collegiate National Championships that year which we had in Durango. I mean I couldn’t have dreamed it up any better. To top it all off I signed my first contract that fall thanks to the help of Ned. I got a road bike with STI shifters, tons of team clothing (not Nashbar) and I was in heaven. All that and I hadn’t done a pro race, had a salaried contract to race semi pro, not even pro. Being a professional mountain bike racer at the time was a legitimate profession. It was 1996, the first year of the semi-pro class at the NORBA Nationals and I somehow managed to win the series. It was also the first year the UCI had the U-23 category for World Champs. I found out I was going to Cairns, Australia, two weeks before the race. I didn’t have a passport because I had never been out of the country but I managed to procure one before my departure with the help of the team and next thing I knew I was having nightmares of the plane crashing as we sped across the Pacific on the longest flight I had ever been on. We landed and immediately went scuba diving in the Great Barrier Reef and then I had to figure out how to call the US from Australia on a pay phone with weird money. 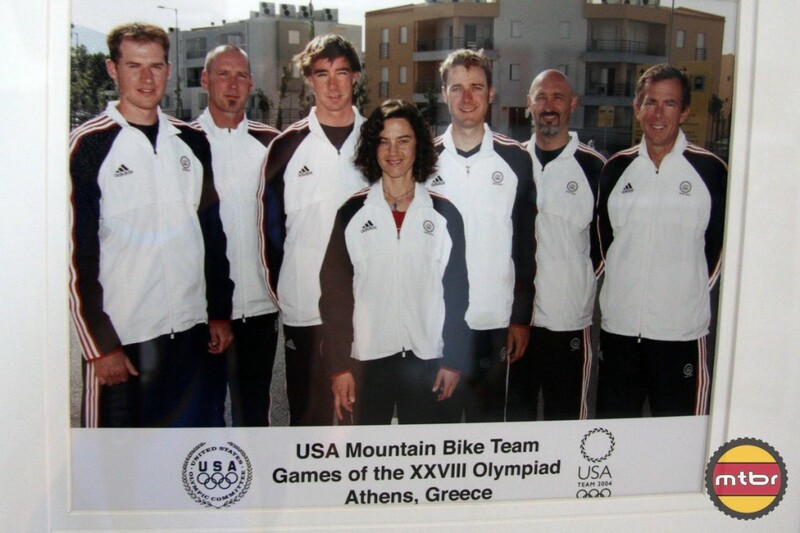 Wells and the rest of the 2004 U.S. Olympic MTB contingent in Athens, Greece. The next year I bumped up to the pro class and though my times had been comparable in the semi-pro races the big boy races were a whole different ball game. You had to go 100% from the start just so you weren’t in 80th place and then try to figure out how to settle in and move up. I think I finished around 20th in the NORBA series that year and managed to meet my future wife, Meg, at the Steamboat Stage race after dropping out. Good thing I didn’t finish that race. If ’97 was a learning year, 1998 they were expecting me to perform. I did and I didn’t. I was supposed to achieve a certain ranking in the NORBA overall to extend my contract. Only US riders had been ranked in the overall series prior to that year but in ’98 international riders were included so I was bumped back quite a bit and didn’t’ hit my extender. My contract was cut. The mid-90s were also the height of the EPO era. It was one of those things where you suspected everyone but no one knew for sure. I can tell you the winners were coming in about 40 minutes in front of me in a 2-hour race. That doesn’t mean they were doping but I wasn’t making up 40 minutes anywhere. I had thought about doping but couldn’t do it. I would love to think it was a moral decision but guys were dying in their sleep, there were rumors national teams were traveling with centrifuges to spin the guys blood every day and people were getting up in the middle of the night to run up the stairs to keep their blood from clogging up. It all seemed crazy. I had fallen in love with the sport but wasn’t willing to risk my life for it. With no contract and afraid to do what it took to make it happen I quit and decided to finish my degree. It was a great decision. I didn’t appreciate cycling and needed to finish school and get a real job to gain some perspective. I had started at FLC with a focus on exercise science but decided to get a degree I could make some money in, Management Information Systems at the University of Arizona. I knew nothing about computers but the internet was blowing up and I figured I might as well learn something that would get me a good job. I knew when I graduated it wasn’t for me. I had interned with IBM while going to school and got a job there, but it wasn’t my passion. I spent my first months on the job getting up at 5:30am to ride before work and taking all my vacation and sick days to go to the races. I wanted to try being a bike racer again. I had also broken up with the girl I fell in love with at that stage race in Steamboat Springs while going to school and thought the best way to get her back was to move back Colorado where I could be closer to her. Racing was the best way I knew to do that. By the end of the summer I had landed a new contract, got back together with Meg and moved back to Durango. Life was good. 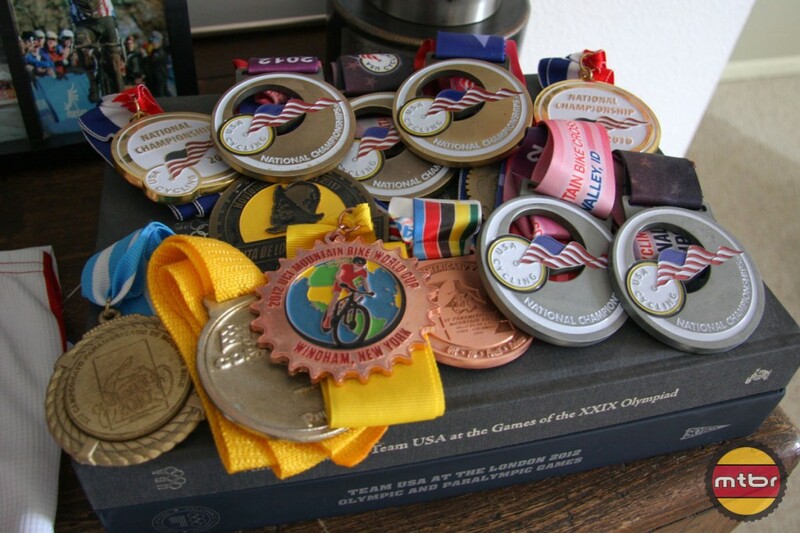 Wells has won countless races over the years and has medal collection to prove it. I had always loved the World Cup and competing at the highest level of the sport. Racing domestically was good but I would beg for the team to send me to the World Cups. I would go over there and get my teeth kicked in all year long. Then I would come home and race cyclocross until Christmas. I just loved to race my bike. My first big break came when I made the 2004 Olympic team in Athens. We had a dog fight to make the two-person team and by the time we got to Athens we were all cooked. I managed to make the team with a 9th place or something close at the last World Cup in the selection in Calgary, Canada. It hailed so hard in the race everyone thought they were going to cancel it. Lucky for me they didn’t. Becoming an Olympian was something I had never dreamed of but was completely amazing. 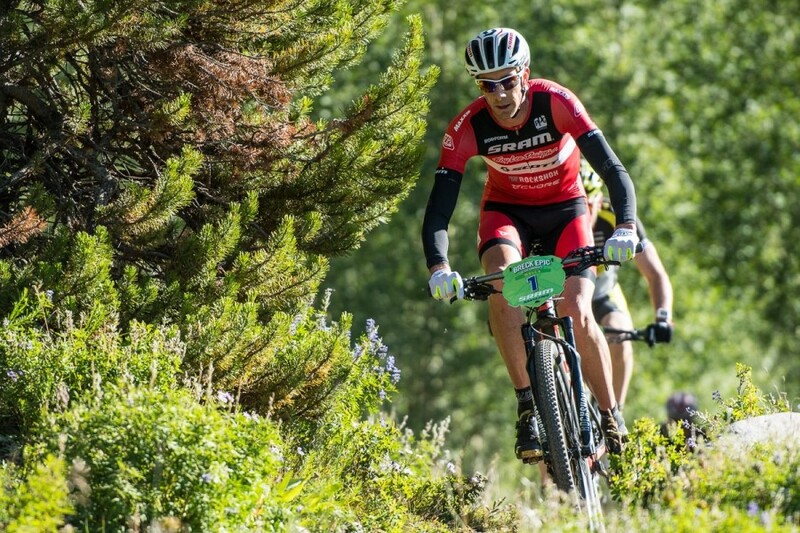 I had no idea mountain bike racing would bring to a stage like that. I think I ended up 14th or 16th. JHK and I finished close to each other. The closing ceremonies were incredible walking into a stadium filled with so many people is indescribable. The next big turning point in my career was 2008. Burry Stander had come on the GT team and we started to travel together. His drive, determination and self-belief were something I had never seen before. At the time he wasn’t a world champ or World Cup winner, just some kid from South Africa that loved free refills on Burger King soda and knew he was going to be the best in the world. It wasn’t cockiness but confidence and it was infectious. Our bikes got stolen out of the GT truck two nights before the first World Cup in Houffalize, Belgium, so we couldn’t ride the course for the last couple days leading up to the race. Our team got some new bikes built up for us and I didn’t have high expectations going into the race after all that. The top of the start climb I had went from 25th to 7th and was questioning whether I should jump across to the lead group containing Absalon, JC Peraud, Fugalsang, etc. I had never smelled the front of a World Cup, or even thought about jumping into the lead group. But there I was. Wells shows off one of his numerous national championship jerseys when Mtbr paid a visit to his Durango, Colorado, home in 2013. I rode with the leaders for part of the race and eventually faded to 11th, but it was a breakthrough in heart of the Ardennes where we had over 200 racers. I had finished higher in World Cups previous to that, but never in the heart of Europe and never actually participating at the front of the race. That year I rode out of my skin in every race except Olympics in Beijing where I sucked. I got lapped with 1 to go and think the pressure of having the potential of getting a result got to me. I know I was riding well because I landed on my first World Cup podium with a 5th in Australia the following weekend. That was the first year I really participated in the races at the World Cup level after a career of trying, it was amazing. To this day I believe that was the peak of my fitness and career. To compete at the global level, you have to sacrifice everything from hanging out with your friends to going to bed hungry. Or at least I did. I had another good year in 2012 after taking myself out in training on the course before the first World Cup. I missed the Cape Epic and quite a bit of racing but came back to land on the podium at the Windham World Cup only about 40 seconds down on Burry who won the race that day. It’s hard to describe the feeling of being in the lead group of a World Cup on the last lap and having your best friend and teammate win. Incredible. I made the Olympic team that year on a coach’s selection just before the Windham race and went on to have my best Olympics, placing 10th and having my teammate at the time Jaro win the gold medal. What an amazing day. The only regret I have from my whole career is not going over for Burry’s wedding in South Africa later that year. I was cooked from an Olympic campaign and knew I had a big trip to Langkawi with him and Cherise later that year so I didn’t want to sit on the plane for an extra few days. I wish I had though because that winter he was hit by a car and killed while training in South Africa. I have never felt such a huge loss. I really feel my success at the international level was a direct result of our relationship and his strong self-belief. After he was killed in 2013 I lost my motivation to race at the highest level. I still loved racing and competing, but no longer had the drive to compete at that top level so I focused more on domestic racing. I still trained hard and made all the sacrifices but when I went from competing at the highest level to just domestic racing my level decreased. It’s hard to describe but once I had pushed to that level and was no longer striving to be the best I lost a bit. I still got some great results but wasn’t nearly at my 2008 peak. Then we had our first son, Coop, and my whole focus changed. As a bike racer I could only be good by being selfish. I had to make everything revolve around my training to get the most out of myself. Some people might have more talent but I believe my results came from hard work and sacrifice of everything not bike racing related. With Coop I wasn’t willing or able to do that anymore, he became my focus. With that I was still able to achieve some good results, but I know my level as bike racer dropped quite a bit when I became a father and I wouldn’t want it any other way. Even though he became my focus I still missed somethings because of the travel or the training or just being too tired to participate. It has finally come time that I’m not willing to do that anymore. I have accomplished more than I ever set out to and experienced things I never imagined all because of my bicycle. I have traveled the world and made friends in far reaches of the globe, places I never really knew existed growing up because of what racing offered me. I am extremely grateful to everyone that helped me along the way and gave the chance to chase my dream. You’re only as good as your support crew and family has always been behind me 100%, without that it wouldn’t have been possible. When you’re in the process of it you don’t appreciate how rare and amazing it is to have the opportunity give 100% to becoming your best. It’s only after you step back and begin to reflect and really listen to people that you realize what a gift it is. That said, I will no longer be racing for a living in 2018. I will still be out there with my coaching business, doing camps, and promoting my MTB Fondo. I will also be racing a little bit, though surely not fighting for the win but suffering just as much if not more further back in the pack. I am looking forward to sleeping in my own bed more and spending more time with Coop and Meg. I am also really excited for my new job in the financial world selling mortgages with Sinberg Capital Lending. Having neglected my family and community for the last 22 years I’m looking forward to being more present and taking the time to enjoy the ride. And eating more cookies. Wells was always a man of many interests, including golf and riding bike that were more fun than fast. 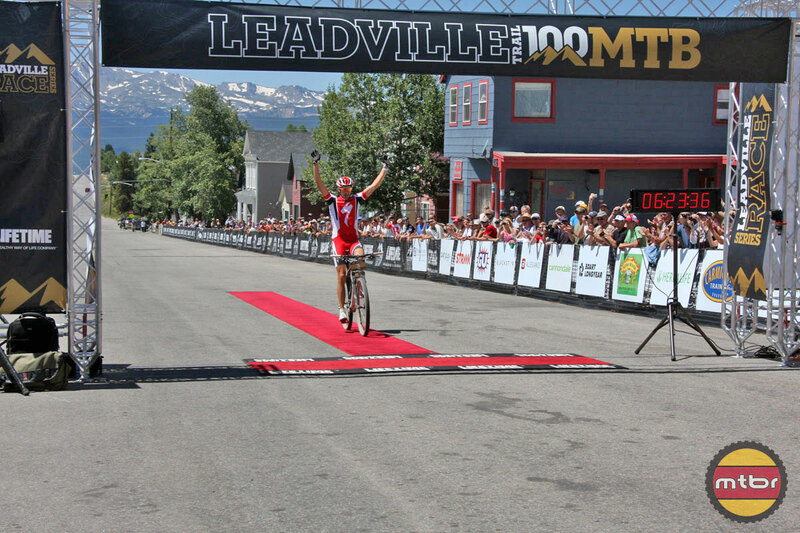 Larissa Connors Diary: We Won The Leadville 100!